Farmers are starting to reap the rewards of harvest, a sure sign that fall is here. Those of us at the Holmes SWCD/NRCS recognize that farmers’ field work doesn’t end with the harvest, as nutrient and manure management are especially important before winter. Following harvested crops up with a good cover crop will help achieve additional protection on soil to allow for the use of manure applications. Planning and preparing to have adequate storage available for winter months should not be taken lightly. For farms without adequate manure storage, making decisions to build a properly-sized facility needs to be done sooner than later. Frozen and snow cover ground application is not acceptable. Applying in these conditions should only be done in an emergency. There are many restrictions that are required to meet the USDA Natural Resources Conservation Service (NRCS) standard for manure application. Therefore, utilizing the fall months for proper land application and preparing to have adequate storage for winter months should be a high priority for livestock producers. Below are some items that are part of the process to meet requirements of the NRCS Nutrient Management (590) standard. Soil Testing: Soil test need to be 3-4 years to be current. 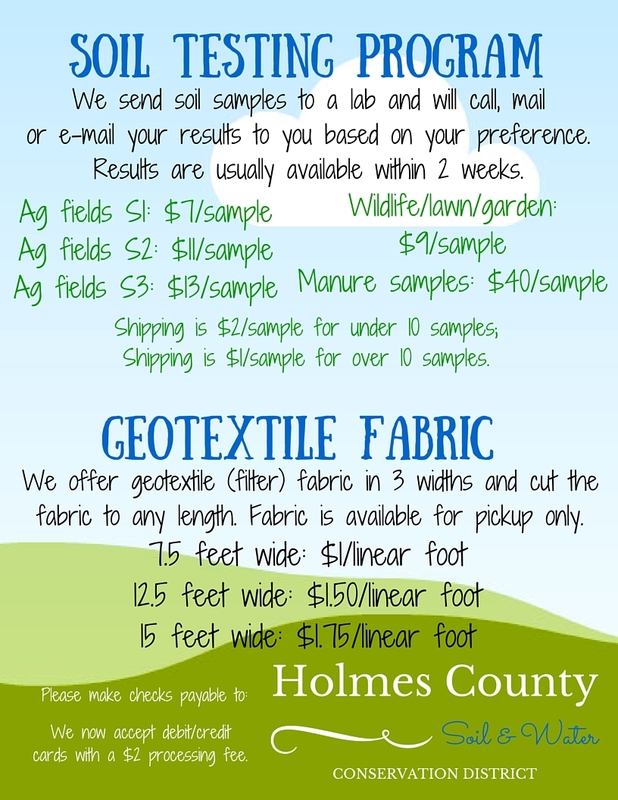 A sample should represent 25 acres or less. Holmes SWCD has soil sample augers and probes that can be borrowed to collect samples. Our office can process soil samples through a laboratory and explain the results if needed. The cost is $9/sample for a standard test. Manure testing: Nutrient values of manure, organic by-products and biosolids must be determined prior to land application. Manure should be tested annually. Again, the SWCD office can assist in the process. The cost is $42/sample. Application Rates- Most of the time available soil moisture in the soil will be 75% to capacity range. Once the soil is at above capacity, applications should be stopped until the soil dries to field capacity or below. 11,000 gallons or less on a silt loam would meet the 75% to field capacity rate. A comprehensive application rate chart is available through our office. Record Keeping- Keeping manure hauling records may keep farmers out of trouble in the event of a pollution complaint, if they can show they are meeting the standards. Being able to document applications will provide proof of what was spread, better utilization of nutrients and possible reduction in the amount of additional commercial nutrients. Frozen or snow covered ground- The standard states that spreading is not acceptable on frozen or snow covered ground. If it cannot be avoided, many criteria too long to list here must be met. Adequate long term and winter storage is a MUST to eliminate the use of this emergency statement. For additional information or to discuss getting started planning for additional storage, taking soil tests, manure samples, developing a Nutrient Management Plan or Comprehensive Nutrient Management Plan (CNMP) feel free to contact the Holmes NRCS/ SWCD at (330) 674-2811 to schedule a time to discuss your needs. Newer PostYour Below Ground “Herd” Needs Fed Too!